Chico State is a competitive rugby school. Its men’s side are one of the top sides in the Pacific Western Conference and a regular playoff team. Their women’s side is also one of the tops sides in the Pacific Mountain West Conference (which in recent years has featured the National Champion UC Davis women’s side). But did you know the Chico State’s Womens Rugby program is the school’s only Division 1 sports team! This weekend they look to make Chico State home of National Champions. 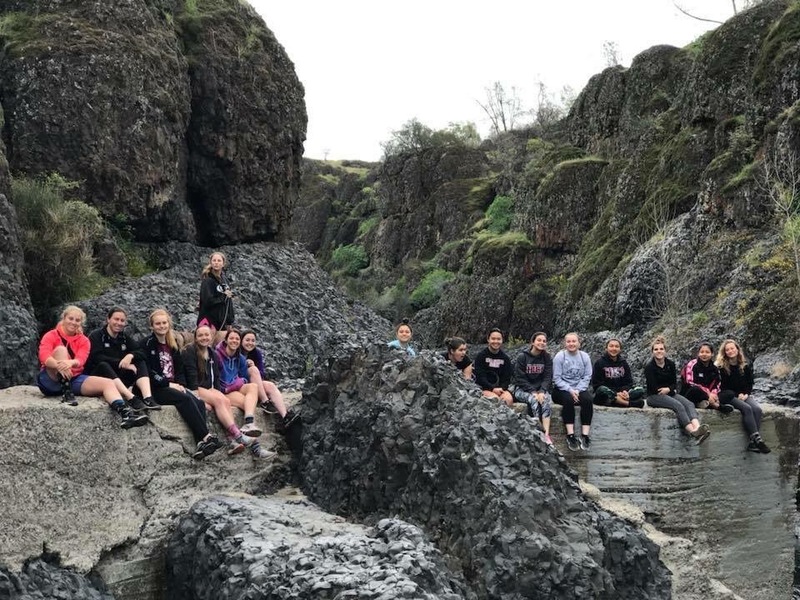 We were able to connect with Chico State during their final prep for the final four this weekend. We were able to pose a few questions to Coaches Alex and Mary Triantafyllou (they are a married couple who both coach the women’s side). Below are our questions and responses from Coach Alex. The Rugby Republic (RR): Normally Chico State is in the mix and a playoff side, but what has lead to the success this year? Coach Alex Triantafyllou (Coach Alex): I believe the team has good chemistry and are working well together. We also have some athletic seniors who have been together three to four years. RR: How have the girls stepped it up? Any specific examples? Coach Alex: They set their goal early in the season to get to the finals. They are up at 6:00am twice a week working on fitness, they come to practice early to work on their individual skills, and they have done additional fundraising to ensure we could afford to travel. RR: What’s the make up of your team (i.e. how many first year players do you have versus seniors, etc.)? Coach Alex: About 1/4 of our players are rookies, 1/3 are third or fourth year players and the rest are in their second year. It is good balance. We have enough rookies to fill the ranks in the future and good number with that three to four year experience. RR: Along those lines what percentage of your players came to the club with prior rugby experience and what percentage had never played before joining up with Chico State? Coach Alex: About 90% of our players have never seen or played before joining the team. So they’ve really worked to get to where they are. Chico after thier win earlier this year vs Stanford. Photo by J. Kort. RR: You play in a very competitive league (the Pacific Mountain West), which includes national champions like UC Davis, Stanford, and Cal to name a few. How does that help a side like yours and also pose challenges with there being a lot of competition? Coach Alex: The greatest benefit of playing in the competitive league is that we are tested week in and week out, which is essential for post season play. The down side is that it leaves very little room for error. One bad match can mean the difference between making playoffs or just going home. It’s a double edge sword. RR: Who are a few players that have took on a leadership role this year and what are somethings they’ve done as leaders that has helped the team? Coach Alex: We have had great leadership from our captains Darby McFall (fullback) and Andrea Valesquez (front row), who were selected by the team. Darby had led from the front. She scored 181 of the 423 points which included 19 tries! She has probably denied as many points from opponents with, what I would consider the most tackling consistency I have seen! Darby has also taken on the responsibility pushing her teammates to do more. Andrea maintains a calming presence on the field. She understands the game plan and makes sure we executing it. Aside from the experience Andrea brings to field, much of her hard work goes unnoticed by the team as it is all the behind the scenes administration that is required to stay on good standing with the Rec Sports Department at the university. Without her, this team would not function as smoothly as it does. RR: What are you doing this week to help keep the focus? Also control the excitement? Coach Alex: We’ve tried to keep some consistency to our practice schedule. We’ve also tried to focus on attack rather than general skills to try and build confidence and hopefully limit nerves. RR: How well do you feel your side matches up against the other sides? Have you been able to get any information or scouting? Coach Alex: Generally, we tend to be smaller than most teams, but this year we have speed to burn, so that helps. University of Central Florida has some big bodies so we will need to get up on them quickly on defense and really try to move the ball around on offense to keep them running g around. We know UVA is traveling with a light squad, only 16 players, but we can’t underestimate them. And while we have met UC Davis twice before in regular season, they have only been to full strength for a couple of weeks. They had some key players out for injury just about the whole regular season. RR: What are three things that your side has to do to be successful this weekend? Coach Alex: First we will have to make and finish our tackles. Second, our forwards will need to maintain their shape in attack, something we have been stressing the last couple of weeks, and finally we , as a team, we need to be dynamic in attack. We can have a tendency to run the same things over and over. If we expand on what we run, I think the game will open up. RR: When you win and bring the title to Chico, where will be the best place for your team to celebrate; the Madison Bear Garden or the Oasis? Coach Alex: Both are great choices and both have supported us over the years. We want to thank the ladies and coaches of Chico State for their help in this story and wish them the best of luck this weekend.